Although Evernote creates a notebook for you when you create an account, and although you can join an increasingly large collection of public notebooks or those shared by your friends, chances are that you’ll want to create notebooks other than the initial one that Evernote supplies. 1Click Notebooks in the left menu bar. Creating a new notebook is a simple task. 2Click the +New Notebook button on the top left of your screen, directly under the top menu bar. A box appears with a space for you to name your notebook. 3Type a name for your notebook and press Enter. For this example, call the notebook Evernote For Dummies Practice. 4Hover your mouse over the box containing your new notebook, and click the gear icon to the right of the notebook name. A box with more notebook settings appears. Here you can choose to rename your notebook, make it your default notebook, and select the notebook type. 5Specify whether to synchronize the notebook. By default, a notebook is synchronized across all your devices. To create it only for local use on this computer, click the Local Notebook radio button. 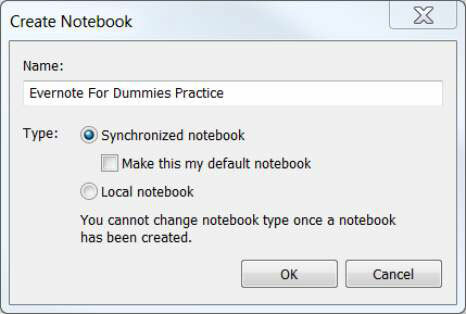 For the Evernote For Dummies Practice notebook, though, leave Synchronized Notebook selected. 6If you want to make this notebook appear automatically whenever you open Evernote, select the check box titled Make this my default notebook. You’re using the Evernote For Dummies Practice notebook just for practice, so don’t check this box. The new notebook appears in the list of your notebooks. To the right of each notebook name, you see the number of notes stored in that notebook. You can have up to 250 personal notebooks on free and Premium accounts plus an additional 100 joined notebooks that are shared with others. An Evernote Business account can have up to 5,000 notebooks and 250 joined notebooks.